We woke early to watch the sun rise over the Sea of Cortez, then walked down the road to Caballeros Restaurant for coffee. After lingering over breakfast with our friends we headed back on route. We made good time and stopped for lunch at the first beach access after our route left the main road. After lunch Neon made some emergency repairs on his bike after one of his bottle cages came loose. We stopped in La Ribera for snacks and water and camped a few kilometers before Los Barriles. Everything was already starting to feel like “the last” …the last beach picnic, the last view of the Sea of Cortez, our last desert camp, the last …everything. We found a place to camp up a hill where we could hear the Sea of Cortez, and frogs in a nearby pond. The next morning we met another Baja Divide rider who is also a thru-hiker. He’s thru-hiked the Pacific Crest Trail and the Arizona Trail. We rode along the Sea of Cortez Coast the whole day, stopping for one “last beach picnic” again. We found a beautiful place to camp surrounded by cardon, elephants trees, tree ocotillo, and all the other Baja plants I’ve come to love. Cows with bells on their necks passed by us all through the night like a jingling lullaby. We woke early and continued along the Sea of Cortez coast. We stopped for another “one last beach picnic” before climbing into the mountains away from the coast. 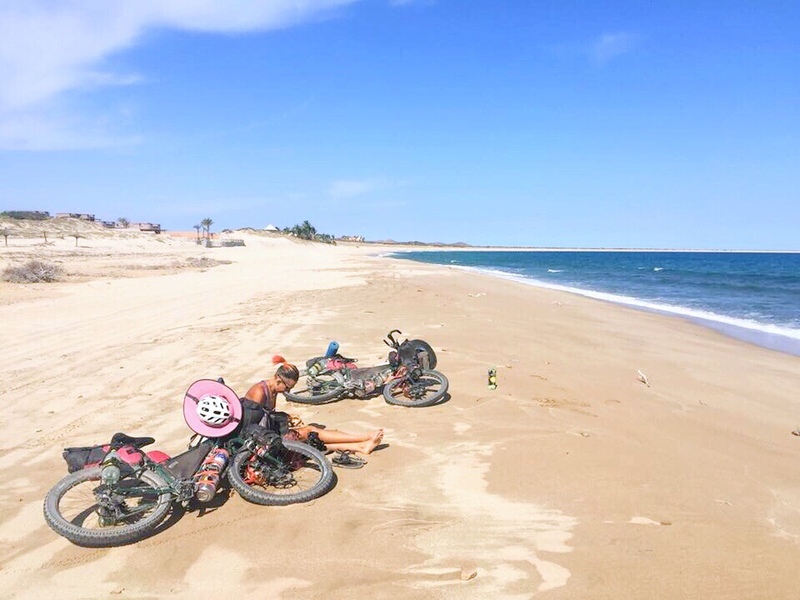 After a fast downhill, we arrived in San Juan de Los Planes midday, bought a few supplies at a store, then rode a little further down the highway before weaving our bikes through the desert to a big wash, for “one last desert camp” in Baja California. It was all a little sweet, and a little sad, being “all done Baja”, and yet we were so ready to move onto the next part of this adventure. The next morning we climbed 700 meters to a pass, then descended 30 kilometers into La Paz. We stoped by a hospital to get another vaccine, went to the Baja Ferries office to purchase tickets for our ferry ride to Mazatlan, then chilled out in a hotel for a couple of days to plan the next part of our adventure.